Hardware and Software Specifications, Examples, Links, and other info. are valid at the publishing time. In case it become invalid use the Internet Search. FAQ - Networking, Internet, Wireless. This page is also available as a RSS feed. Add this feed to a RSS Reader and each time a new entry is added to this page it would alert you and provide a link to the new FAQ. Click on the XML icon for configuration info. Is Sharing the Internet let you Share files too? CAT5e Straight or Crossover, what should I use? How to Extend a Network Cable? How to Configure a Laptop (or any computer) to connect to more than one Network? How should I adjust the Network Cards (NIC) Speed? What is a Mapped Network Drive? How to measure the Speed of transferring files between Networked Computers? Can I use Firewire to exchange files between two computers? How I set my software Firewall to allow free traffic between my Networked computers? What is Ghost Hardware Installation? Can I share my computer's attached scanner with other computers on the Network? My Network claims that my Cable is Unplugged? By pass Windows Logon Name and Password. Changing Local Area Connection’s Number. USB device on the network. Adding Wireless to a Wired Network. So many thing are called Wireless, do they work together? Disabling SSID, would my Wireless Network be more secure? I need a Wireless Card what should I get? I have a Good Firewall does it secure my Wireless? How many concurrent users can surf the Internet through the same Wireless Connection? Can I use all the computer as Wireless with No Wired computer? Why I see Wireless connections that are not mine in my Wireless Network display? My Wireless Suddenly does not work any more. WEP pass phrase (password) does not work. I do not have a Wireless Icon in the Tray Bar. Router or Switch, what do I need? I need a Wire only Router would should I get? Do I need to use a Cable/DSL Router Firewall and a Software Firewall? I have an issue with my Computer's Ports, what is going On? My Computer/Network is generating a lot of action even when I am not doing any thing. I checked for Viruses Trojan’s etc. and it seems that the system is clean. What shell I do? Q - Is Sharing the Internet let you Share files too? A - Unfortunately there is a state of confusion that derives from the usage of word Sharing for both Internet Sharing, and File Sharing. These two types of Sharing have to do with Network computers but they are not practically related one the other. Sharing the Internet allows you to share one Internet source (account) among few computers. This is usually achieved by using a Cable/DSL Router or a form of software called NAT (like Windows native ICS). AnandTech - FAQ. Basic Options for Internet Connection Sharing. AnandTech - FAQ. Hubs, routers, switches, DSL, LANs, WANs...? 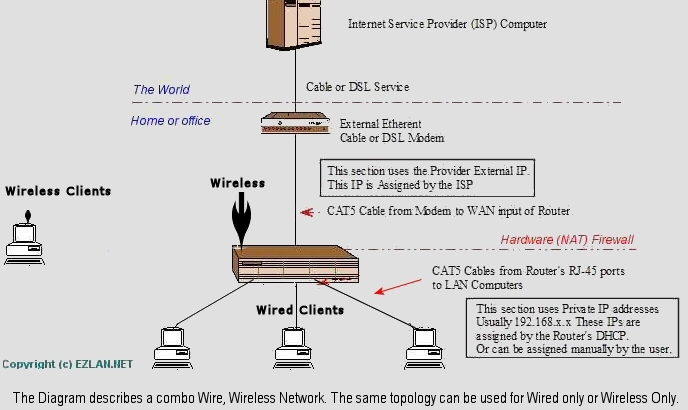 Diagram of Broadband Internet Connection with Cable/DSL Router. Q - CAT5e Straight or Crossover, what should I use? A - When you have two (or more) devices that are transmitting and receiving through cable you can use straight cable connection. If you connect straight the transmit output to another devices transmit output put and the receive input to a receive input there would not be exchange of info. The solution is to invert the cable arrangement inside so that the Transmit output of one device would go to the receive input of the other side. In the networking world such a cable is called cross over cable. In addition RJ-45 (Network's port) can be wired inside Straight (on a computer) or crossover (on a Router/Switch). More detailed explanation here: CAT5 Straight, Crossover. What is CAT5, which one should I Use? NIC to NIC - Crossover Cable. (Computer directly to second computer). NIC to Hub/Switch - Straight Cable. (Computer to Hub/Switch). NIC to Uplink - Crossover Cable. (Computer to Uplink on a HUB/Switch). Hub/Switch (regular) to Hub/Switch (regular) - Crossover Cable. Hub/Switch (regular) to Hub/Switch Uplink - Straight Cable. Hub/Switch Uplink to Hub/Switch Uplink - Crossover Cable. Cable/DSL Router WAN Side is an Uplink jack. Cable/DSL Modem RJ-45 port is the same as a Switch port. A lot of newer switches and Routers have MDX ports (look at your hardware Data Sheet), if such is the case it does not matter this type of port would adapt to the cable. Q - How to Extend Network Cable. Or I ended up short on my Network Cable what shell I do? A - You get a CAT5 Coupler (Radio Shack is one of the sources). There are two types of Couplers. Couplers are a good for on the spot solution, and might work well for long time. Eventually you are better of exchanging to one solid cable. More about network Wiring here: Wiring - I would like to wire my Networked Computers (Home Wiring). Q - My Network claims that my Cable is Unplugged? A - Cable Unplugged is one of the ways that Windows tells you that the computer can not use the Network connection. It could be a loose cable with "iffy" connection, but many times it is Not the Cable per-se. If you are sure that the Cable is OK.
Q – How to Configure a Laptop (or any computer) to connect to more than one Network? A - If you have WinXP and need to configure the computer for two independent connections, Windows let you configure two TCP/IP stacks. Click on Control Panel / Network Connection, and right click on the active Local Network Connection to get the properties. Choose the TCP/IP properties then the Alternate Configuration, and configure it with the entries pertaining to your second Network. Screen Shot of the Menus. If you do not have WinXP, or need more than two connections, or you are not comfortable with this setting, you can find an Inexpensive Utility that aids you in such a configuration. Two of the above programs are offered as shareware they all work well; you can try and use the one that is best for your specific needs. Q - How should I adjust the Network Cards (NIC) Speed? 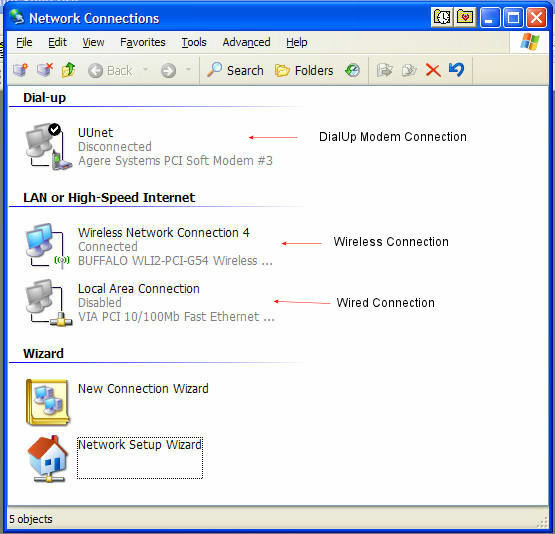 A- Click on Control Panel / Network Connection, and right click on the active Local Network Connection to get the properties. 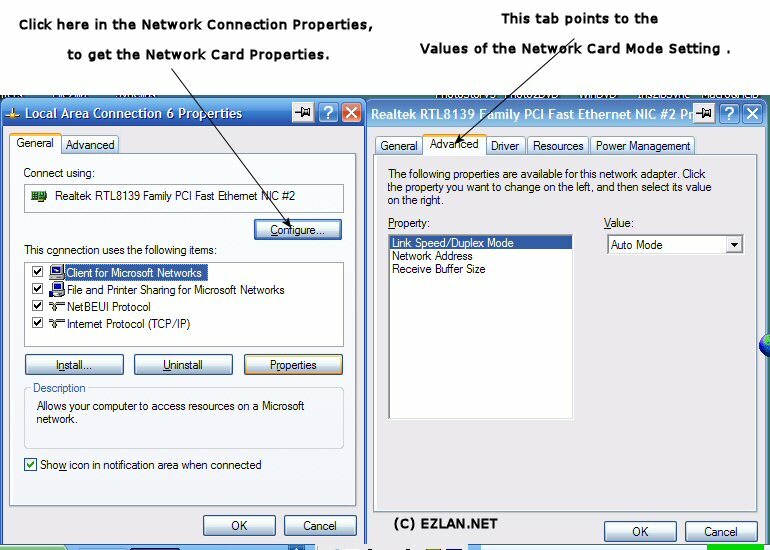 Click on the Network Card configuration and choose the working Speed (bandwidth) of the card. In most cases it is best to choose the Auto Mode. However if you are sure that all your components are 100Mb/sec. capable and part of your Network seem not to be capable working at the right “Speed”, you can try to force 100 Full (or duplex). If the components are not capable to maintain the forced Speed your Network might crush and you would need to adjust the Mode to its previous setting. This procedure has to be performing on each computer on the Network and the setting should be uniform across the Network. I.e. All Network Cards should be on Auto, or 100 Full, etc. The Network Cards menus might look different in various cards but the same principles apply. Info about the Actual Functional Speed of Windows Network can be found at this page. "Speed" (Bandwidth) expectation of Ethernet Home Networks using Windows 98/2000/XP. Q - I have two Network Cards (NICs) on my Motherboard what can I do with them? A - Most up scaled new Motherboards are sold with two onboard Network Cards; many times, it is 1Gb/sec. cards. Many End Users seek a way to use these NICs, looking forward to be able to use them together and fulfill the quest for more Power. There are configuration under which two NICs can be configured to “Team” and provide more Bandwidth (Speed). However, this can be done when using a Real Server OS (like Windows 2003) with special managed switches and teaming software. I.e. professional hardware/software that goes into the thousands. The following can be done with regular computers that use Entry-Level hardware and running client OS (like Windows XP). If you have broadband Internet connection and No Cable/DSL Router, the two NICs with conjunction of Routing software (like windows ICS) can be used to share the wired connection. If you have two Independent Networks, and you need to Bridge them a computer with the NICs, running Win XP Pro can be used for bridging. To make it clear 98% of End-User do not need the two usages mentioned above. Why the manufactures provide two onboard NICs? It cost less than a $1 to add the second card, and it is a good Marketing Selling Point. Q - How can I Keep the same IP for each Network Device. While keeping the same local IP is a good idea for all Networked devices it is an utmost need in case of Networked Devices that are used by all the computers on the Network (Network Printers, or Networked Storage units). If the IP of the devices mentioned above changes often the Network would work slow down and sometimes the devices would not be found at all. In general there is two ways to assign a specific IP to a specific computer, printer, or other Network device. 1. 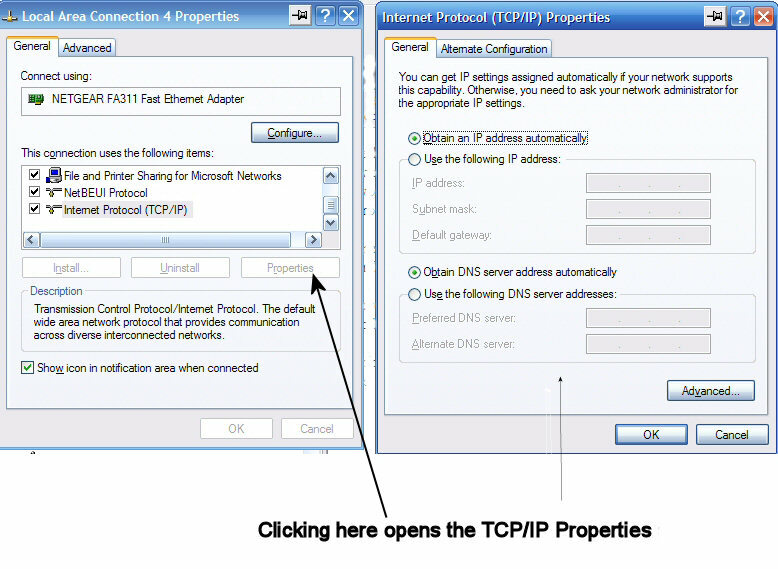 Assign a static IP in the Device's TCP/IP Properties. 2. Use a Router that can do IP reservation within the DHCP (aka Static DHCP). Static DHCP means that the network device can be set to Auto Obtain IP and it would be always assigned with the same IP number. If your Router can do Static IP, the computer's TCP/IP properties should be set to Auto Obtain IP, and the Router can be set to provide a specific IP within the DHCP range to be reserved for a specific computer/device according to the computer/device's MAC address. Read your Router’s manual for the specific setting. Please note that providing this feature is not common to all Routers. 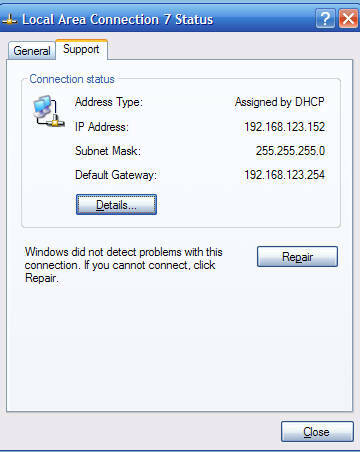 As an example most of Netgear Routers can do DHCP Reservation, while most old Linksys Routers cannot. If this is an important feature read the Router’s manual before you buy. Almost all Routers manuals are available as pdf download on the manufacturers support site. Note. Static IP, DHCP, and Static DHCP can be use at the same Router as long as the Static IPs are not within the range of the DHCP server (Read your Router manual to find what is the default setting of the DHCP). Q - How to get Rid of Old Networks Names (Icons, links)? When a user changes Network name, computer name, or and relocates a computer from one Network to the other, residual annoying icons (links) might stay around, leading to Nowhere and distracting users. Some of these Icons are links that was created by the user himself, these Icons (links) can be deleted and be done with. Other icons, or links in the Network's resources folders might not be allowed to be deleted. Make sure that all the computers on your Network are assigned with the exact Network Name, but have a unique computer name. When everything settles down after few reboots, the previous Network's resources will disappear by themselves. Q - What is a Mapped Network Drive? Important: Only Drives that were set correctly to be shared across the Network can be mapped. If you have Sharing problems, this might help: Sharing Disk Drives on Windows Network. A - Mapping a Drive through the Network allows you to treat the drives of other computers on the Network as though there are additional drives on your computer. Let say that we have one computer name Jack and another computer name Nick. Once you set the Network and the Network Sharing you can map the Drive C: of Computer Nick to be available on Computer Jack and assign to it a local drive letter Example: N (or any other available letter). You can also map on Computer Nick a network drive with the letter J using Jack’s C: Drive and you would have on Computer Nick a drive J: that let you use Jack’s Drive C: on Nick. Floppy, CD-ROM, ZIP, and USB drives can be similarly be mapped too. Q - How to map a Drive? A - Log to Windows Native Help, enter the term Map a Drive and it will guide you through the easy process of Mapping, or and disconnecting Network Drive. Q - How to measure the Speed of transferring files between Networked Computers? The simplest way would be to transfer a 10MB file between two computers and measure the time. As an example if it takes 10 sec. to transfer the file your “Speed” is 1MB/sec. or 8Mb/sec. (B=Byte, b=bit, 1Byte = 8bits). Qcheck by Ixia - If you would like to try in Pro Style. The Software below is considered the unofficial Standard for Network traffic. You use it for both Wire and or Wireless. It does not matter whether it is Wireless or Wired since your Interest is in measuring the functional traffic and not the medium. This Free tool is a subset of Chariot which is considered the Standard in evaluating Network Bandwidth connectivity. Link to Product Description: A Free Utility for Network Troubleshooting from NetIQ! After reading the page, log here: Qcheck Download. You have to give some info and your email, but this Application really worth it. Down load the Main Program and a copy of the stand alone End Point. You have to install the Master program on one computer (Main computer, or serve). Install the End point Client on all other computers on the Network. Q - Use USB device on the network. A - Regular USB has two types of connections at the two sides of the cable that connects to the device. 1. Master Side that is plugged to a Computer and in order to process the traffic it needs the computer’s CPU and other part that are on the computer’s motherboard. The master side is usually the familiar rectangular large USB plug. 2. Client side, the sides connect to the peripheral device (Printer, Camera, mouse, etc. The plug is usually square or very small rectangular. Some small devices like Wireless thumb card do not use a cable and thus includes only the plug for the computer side. It is not a matter of plugs compatibility, even if you find an adaptor that changed the size and the gender of the USB plug, the device needs to connect according to its original design. As an example, plugging a USB Wireless card was designed to connect to a computer to a printer would not make the printer Wireless since the Card was not designed to work with the electronic circuitry of a printer. There are special propriety USB adaptors that are built with inside emulation of the computer USB circuitry (which usually makes them more expensive) and therefore can be plugged into a None computer device that it was designed for. As an example, there is USB Printer Server (Wire, or Wireless) that can turn a USB printer into Ethernet Printer Server. USB printer server would work only with printers; it can Not be used to convert other USB devices to be Ethernet Network compatible. To interface with a computer the USB device needs drivers, since you can not install the drivers on a passive hardware card as you install them on a computer, the drivers need to be incorporated within the device's firmware. That restricts the general use of the unit (I.e. you can not install in firmware all the drivers of every USB card that is available now on the market, and would be available in the future). I addition the peripheral device itself has to be Network capable. As an Example sticking USB to Ethernet on a Scanner will turn the scanner into a Network recognizable device, since windows does not recognize regular scanner as a Network device. Q - Can I share my computer's attached scanner with other computers on the Network? 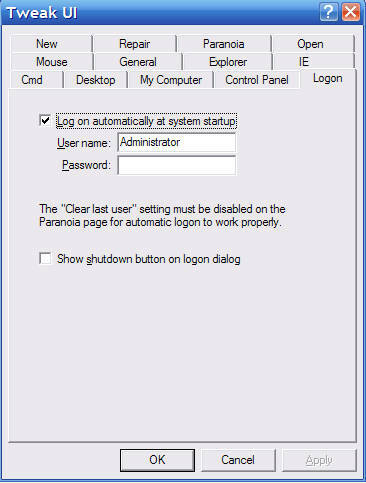 A - Regular Scanners are Not Network Devices Native to Windows and thus can not be shared while attached to a computer. You need to buy a Scanner that is Network capable; such a scanner is plugged directly to a Network port, and can be shred by all the computers on the Network. Brothers Brand has sub $200 “All in One “ units that includes a scanner and it is Network enabled. Other Brands have similar Hardware. Network Scanners are usually geared toward Office use and thus they are more expensive than regular scanners. There is software that can make a regular scanner Network able. Unfortunately this software is expensive to the extend that you are better of buying a New Network Capable scanner. All in One (AIO) units are posing a challenge as Network Devices. All in One unit that is Network Ready can be connect with a network cable to any port on the Network (Some models can be made Wireless too by fitting it with a Wireless Client device that is used for game boxes), and all the functions can be used by all Networked computers. If the unit is a regular unit (I.e. Not Network ready), it can only be connected directly to a single computer, or can be fitted with 3rd party printer server card, and connected to the Network. However, all the functions of the AIO would be available only if it connected to a single computer, and only to the Single computer itself. Otherwise in any other scenario only the printer part would be sharable over the Network. There are 3rd party devices Software/Hardware that can turn a regular All in One unit to be Network capable with all of its features, however these devices are more expensive than buying a New inexpensive Network ready AIO unit. As an example, Staples, and others, offer (2006-2007) Network Ready Brothers Brand All in Ones for ($100-$150). Sharing Regular Printer over the Network. On the computer that the printer is connected to, log to Control Panel / Printer and Faxes, Right Click on the Printer to be shared, click on Sharing, check Share this printer and give it short simple name. Make sure that you have the Printer Drivers on hand. 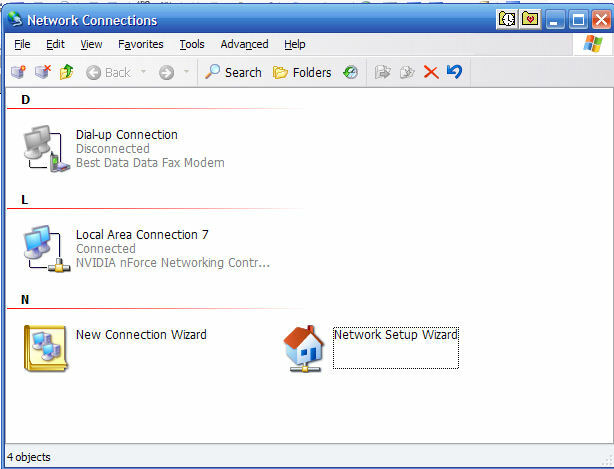 On the computer, that does not have a printer, log to Control Panel / Printer and Faxes, Click on Add a Printer, click next, and choose to install Network Printer, continue with the Wizard as instructed. Q - Can I use Firewire to exchange files between two computers? A- Yes, Firewire can be used to network computers and exchange files. However as is there are few limitations when using Firewire as the medium for Network exchange. The sharing protocol has to be TCP/IP. Firewire uses IP over 1394 and does not work with NetBEUI or IPX). Maximum distance (length of cable) is 15 feet. If your Motherboard has Firewire capacity Windows would install the Firewire as a Protocol upon boot (It appears as 1394 Network Connection). Once it appears in the Protocol list it behaves like and additional TCP/IP. This page lists all the mediums that are Network capable in Windows. Q - How I set my software Firewall to allow free traffic between my Networked computers? A - Software Firewall intercepts the TCP/IP traffic, since most of Windows Networked computers use the TCP/IP protocol for local file sharing it might intercept and block the LAN’s traffic too. 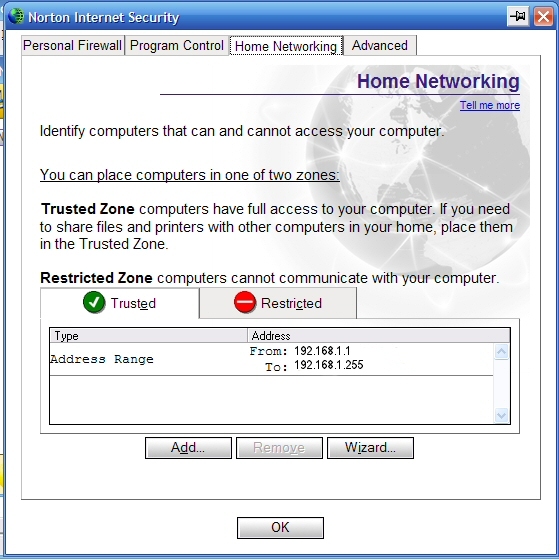 Almost all Software Firewall includes a setting that let you to enter the IP range of your Networked computers and thus allow free flow of TCP/IP traffic between these computers without the Firewall's intervention. This function is usually referred to as Computers in the Trusted Zone. I.e. trusted to allow uncontrolled traffic. I would use as an example one of the most popular software firewall Norton Internet Security (NIS). 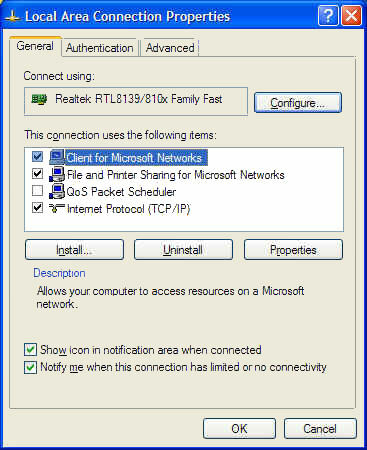 Open NIS main menu and highlight Personal Firewall, click on Configure and choose the Home Network Tab. Click Enter / Choose Entering Range and enter into the menus the lower and upper IP range of your Local Network. The above is a Screen Shot of the Menu in NIS 2003 there might be variation of the process in other versions but the principle is the same. The same applies to any software Firewall. It might use terms like Allows, Trusted etc. you might find the way to set the “Trusted Zone” by looking at the Firewall’s Help menu under the Local Network (LAN) section. 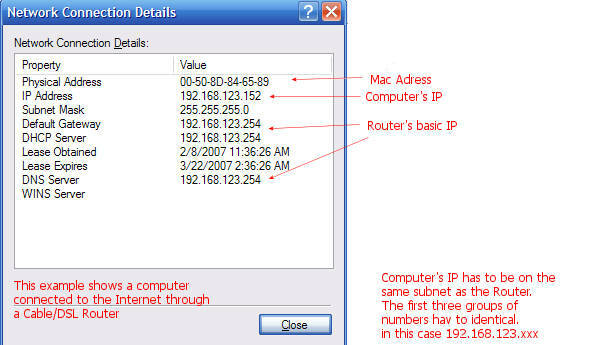 If you do not know how to obtain your Network’s IPs this might help. How Do I Find my IP and MAC Numbers? Using IPCONFIG and or Winipcfg (Wntipcfg). Utilities to find IP and MAC address, and other Local Network Info. Q - What is Ghost Hardware Installation? A – Ghost installation is an unofficial term that is used by computer hobbyists to describe a none function (failed) installation of a Hardware device in Windows OS. In case of Network that might occur when installing a Network Card, Wireless Device etc. When you first install Windows or and add a Hardware device, Windows would first search its own data base and will install the appropriate driver for the device. If Windows does not find a suitable driver it will prompt you to point to the driver location. If you do not point to the suitable driver, or you abort the installation, a None Functional Entry would appear in Windows Device Manager. To indicate the problem a Yellow exclamation mark would appear next to the Device entry. This yellow exclamation mark is called “Ghost Installation”. Similarly if the correct driver was supplied but there is resource conflict that is created by the Hardware the “Ghost” will appear in the Device Manager. Such a Device (I.e. a Ghost Device) would Not work, and might cause problems to the whole system. Right click on the Ghost Device and Click on Uninstall, the Ghost will disappear. Make sure that you have the correct drivers and reboot the computer (Windows will attempt on reboot to install the Hardware once more). If the Drivers are OK and there is a resource conflict. Uninstall the Ghost, switch off the computer and try to insert the device into another slot on the motherboard. Some times the Ghost will not clean itself easily. In such case Uninstall the Ghost again, switch off the computer and take the device out (if it a device is part of the Motherboard disable it in the BIOS). Boot the computer one time without the Device. Windows will clean it self and get ready to the next attempt. Q - Monitor Network Resources, and Traffic. A - To get your Network info. It is one Exe file notching to install. Put it on your hard drive and drag a link to a spot of your choice. Run the program, in few seconds it will show you all the computers on the network, MAC addresses, pings, shares, and more (make sure to look at the Options Menu, and check all the options that would like to see). Make sure that if you have Software Firewall that all the computers are on the Trusted Zone. As far as Network traffic is concerned it is a more complicated issue. In order to monitor the traffic of a Network through a central point, the Network has to be configured with Central Server Topology using Server OS (like Windows 2003). Note: Most small Networks are configured around Cable/DSL Router, unfortunately, Entry Level Cable/DSL Routers do not provide the capacity to read the traffic that passes through. Q - By pass Windows Logon Name and Password. Q - Changing Local Area Connection’s Number. A - When Windows is freshly installed, the Local Area Connection number would be #1. However, every time a deletion reinstallation etc. is done to the Network Card, the number changes upward. Therefore, even if there were only one connection it would look like this, http://www.ezlan.net/example/lan_num.jpg (says #7, but I have only One). Functionally this "miss numbering" does, means anything and it does not affect the Network components. For some users it causes an imaginary problem, however, the problem is human Psychological Distraction rather than a computer/network issue. It is possible to reset the connection to read #1. However, it is a tedious process that involves dealing with hidden Network components, multiple changes, deletions in the registry, and with a need to reboot the computer many times. The end might result with a “Trashed” system. So the best advice is “Let it Go”. Q - TCP/IP Connection's Details. A - TCP/IP Connection Details. Windows XP provides a way to see the information about the Network’s settings parameters. If you have a connection icon on the tray bar click on it (Otherwise, log to the Control Panel/Network connections. Double click on the Connection Icon). Q - Router or Switch, what do I need? A - A Switch is used to connect few computers together. If you do not need to share Internet Connection and you are building a Network you need a switch. If you have a Network of few computers and you have only one Internet account with one available IP, you can not connect a Switch/Hub directly to the modem. Since you have only one Internet address the Internet signal would know to which computer it belongs. Hence comes the typical Entry Level Cable/DSL Router that includes Network Address Translation (NAT) circuit that Routes (Splits) the Internet signal to few computers. Almost all of the Entry Level Cable/DSL Routers are a combo unit of a Routing circuits and a 4 ports switch. So if you need to share the Internet and connect few computers together you buy a Cable/DSL Router and you get a switch in the same box. Q - I need a Wire only Router would should I get? A – Look around for bargains and do not be surprised if you would find that a Wireless Cable/DSL Routers are less expensive than a Wire Only Routers. In other words you can buy a Wireless Router, disable (or block) the Wireless part and use the Wire part. As for Wired Routers, which brand? It does not really matter, for regular use get the cheapest that you can find. Q - I want to be secure, do I need to use a Cable/DSL Router Firewall and an additional Software Firewall? A - Yes you do. A Cable/DSL NAT Firewall provides only partial one way (Internet In) protection. To insure Global protection of your computer/network you need to add the comprehensive capacity of good software Firewall. More here: Basic Protection for Broadband Internet Installation - Routers and Firewalls. As a frame of reference, the best “Speed” of Dialup is 53Kb/sec. that would yield about 6KB/sec. of optimized download. Optimizing & Measuring the "Speed" of Internet Connection. “BAD” lines might reduce the Speed so it is recommended to make sure that you have a Good line from the NID (the Telco line in box) to the computer. If money is No an object you might find a Dialup ISO that provides a Bonded Dialup service. With a special modem and am account with such a provider, you might be able to double you Dialup Speed. If you would like to Network and share Dialup, and or use Wireless this might help. Sharing the Internet with Dialup Connection. Would I get faster Internet if I subscribe to one of these services that “promise” Dialup that is fast as DSL? When you subscribe to the service, you get an account and you do all your Internet activities through their Server. Since all your traffic goes through their server they, can selectivity cache and compress part of the files that are involved in the surfing process. If you log frequently to a site that uses large uncompressed html files you might experience some improvement. Downloads of Files would not benefit from this arrangement since downloaded files are already compress, being one time affair (i.e. downloading a specific file) they would not be available in the cache to begin with. If log frequently to site that do not frequently updated you might experience slight improvement since they probably will be already cached on the server. In sum, the mainstream average surfer will not gain from such a concoction. People that do not download much and visit the same sites on a daily might gain a little. Q – I have an issue with my Computer’s Ports, what is going On? A - Hardware wise Computer’s ports are always Open. If the Computer's ports would not be internally Open the computer would Not function. However, since the ports are also used for Outside Communication it is advisable to close the ports to the outside in order to be able to control In and Out communication. Closing Ports is done with a Software Firewall or and a Cable/DSL Router. There are applications/games that work on your computer and need to interact with the Internet, or and your LAN. Each application might use specific ports that need to be open so that the application can access the Internet/Network. Application's Ports are Specific to each application and you would find the info. on the application/game manual or support site. The way to open ports is specific to each Router, or and Software Firewall. You have to look at the software/device manual to find the instructions. This page describes the issues and what to do about it: Cable/DSL Routers - NAT & Ports. Note* Windows XP SP2 comes with a Software Firewall installed and Switched On. I.e. The ports are closed by default with Windows native Firewall. If you disable the Firewall all the ports are going to be open but you would not be protected from Internet attacks. Q - Adding Wireless to a Wired Network. A - To add Wireless to an existing Network you need to buy an Access Point and plug it to an available RJ-45 port on a switch/hub or Wired Cable/DSL Router. Equipped each computer that you want to make Wireless with a Wireless Client card, configure and enjoy. Q - So many thing are called Wireless, do they work together? - Wireless and Network terminology. A - One of the confusing aspects related to the world of Networking is the use of the same terminology to describe unrelated or partially related functions. The term Wireless is used to describe: Wireless LAN, Wireless Internet, Wireless Phone, Wireless keyboards/mice, etc. Do not let the usage of the word Wireless confuse you. Technology wise all of the above are Independent types of hardware each type using its own technology and there is No relations between them as far as proper computer functions goes. Most confusing is the issue of Wireless Internet, it is usually describing the way the Internet service is obtained rather then a specific nature of the technology. Wireless Internet can be a feed from Satellite, Surface Wireless service, Cellular phone, or a close by Ethernet Network (like in Internet café). Each one of this methods are not compatible with the other and have only one purpose to brink Internet to your system. It is not providing Wireless Network. A connection to an Ethernet Network (usually from a Wireless Cable/DSL Router Access Point) is the only form of Wireless that is similar to regular Wireless Network (802.11x), all the others are independent types of technology that not related to consumers Networking hardware. In other word if you want to Network with Wireless you need to make sure that you get a 802.11b. or 802.11g or 802.11n system. Q - Disabling SSID, would my Wireless Network be more secure? A -The SSID is necessary for proper Wireless function. and need to be set On. Thinking that Disabling SSID is really adding security to your Network is false. Regardless of the status of SSID, any serious intruder can use free widely available sniffers and will find your Wireless connection. Disabling SSID makes you partially invisible to innocent leeching neighbors. You can use MAC filtering and it would provide better security against innocent leecher. Wireless Encryption - WEP, WPA, and WPA2 (802.11i). Network segregation - Adding security to Wireless Network (or any peer to peer Network). Q - I need a Wireless Card what should I get? A - Wireless cards come in variety of flavors. The three basic types are PCMCIA, PCI and USB. When it comes to Entry Level Wireless Clients almost all of them are based on the core of the PCMCIA cards. The so called USB is usually PCMCIA card connected under the plastic to a USB interface. The so called PCI is PCMCIA plugged or soldered to PCI interface board. Since the PCI and the USB are PCMCIA with additional interface circuitry and different buses the performance resultant is some what less (about 5%-10%) than pure PCMCIA. For a Desktop (or tower case) USB Wireless Client Card should be considered as the preferred solution. Wireless is depending on signal propagation. PCI Wireless Client Card ends up been stuck behind the computer's case, resultant in obstructed transmission and poor performance. USB is connected to the Port with 2-3' cable allowing the Antenna to be placed above the System for better Transmission. However a PCI card is a good choice if it equipped with a Removable Antenna. In such case you can you can fit a good External Antenna with a short coax wire that let you place the Antenna above the system and would provide much better wireless signal. Q - Why I see Wireless connections that are not mine in my Wireless Network display? A – When looking at the available Wireless Networks, many people see additional Wireless connections that do not belong to them in the Wireless Network display. The tendency is to react with a combination of Anger and or Fear feeling that there might be an invasion to our privacy. Wireless Signals are propagating through the air like any other "Radio" signal. As a result any Wireless Networks in your reception area (yours and others) would appear in the list of available sources. (Just like your Radio/TV that can receive all the Radio/TV stations in your area and you choose the one that you want to use). If you do not want to use the Wireless connection at all and your computer came configure with active Wireless, switch it Off. 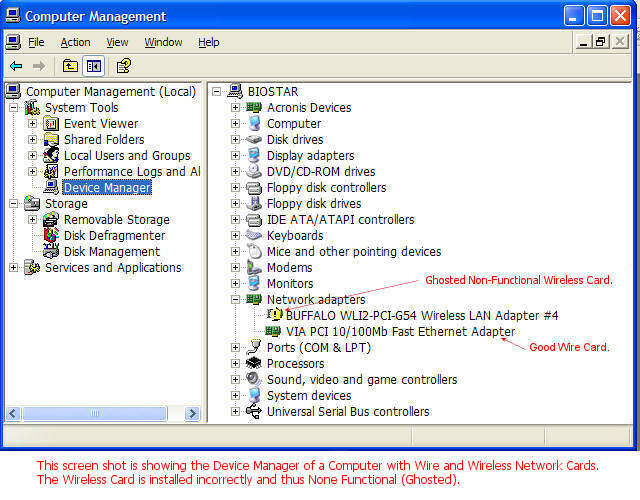 Most computers with preinstalled Wireless come with a physical switch or a combination of the Function button and allow easily to switch off the Wireless Network Card (read the computer manual concerning your Wireless). Otherwise Secure your Wireless to the Max. that your Wireless hardware allows. The probability that some one would actually be able to log and use your Wireless Network if the Wireless Security is adequately set is extremely low. There are few Entry Level Wireless Gizmos that have settings to eliminates the display of the unwanted sources from the list; it is an artificial arrangement to make people feel good, programs on your computer can not eliminate the real presence of the transmission in the air. Q - I do not have a Wireless Icon in the Tray Bar. A - If your Wireless connection works OK using Windows Wireless Zero Configuration, and you do not have a Wireless connection Icon in the Tray Bar. Click Start /Run Type into the Run box: control ncpl.cpl click Ok.
You see now the Control Panel's Network Connections. Double click on the Connection Icon and click on Properties. Check the two Boxes at the lower left Side. Q - I have a Wireless Cable/DSL Router and few computers can I use all the computer as Wireless with No Wired computer? A - Yes, Technically you can. However, if you do not have at least one Wired connection to the Router you might not be able to configure the initial connection, and if the Wireless for some reason stop working, you would not be able to connect to your Router in order to Fix it. Therefore it is Highly recommended to connect at least one computer via wire to a regular RJ-45 port on the Router so you can configure the Wireless Router. More info here: Wireless - Basic Configuration. and here Wireless - Security Configuration. Q - I have a Good Firewall does it secure my Wireless? A - Bear in mind that though the same word Security is used to describe Secure Internet Connection and Secure Wireless from a Computer functioning perspective there is No relation between the two. Wireless Security has Nothing to do with securing the Internet Connection. Wireless is just a replacement for a Wire and thus can be intercepted by people in the neighborhood attaching them self to your Signal and use your LAN and your LAN's Internet Connection. To avoid Local Tapping there are Wireless Security measures. These measures are unique to the Wireless components, and have to be used even if there is No Internet Connection. These short pages describe the basic principles of functional Wireless Security. Cable/DSL Router Hardware NAT and Firewall/AntiVirus/AntiSpy applications are the ones that protect the Internet connection from being invaded/infested, and preventing your LAN computers (Wired and Wireless) from transmitting out to the Internet privileged information. All the computers (as a Network) would have basic Internet protection by using a Cable/DSL Router. In addition, each computer on your Network that has access to the Internet should have its own Internet Connection protection regardless of whether it uses Wire or Wireless. In addition you should have tools available to clean your computers if they get Infested with Internet "Junk". Q - How many concurrent users can surf the Internet through the same Wireless Connection? A - For basic smooth Internet surfing a wireless signal that maintains a bandwidth of 1-2Mb/sec. is needed. A typical good 802.11b would provide 4-8Mb/sec. I.e. 2 to 4 good concurrent connections (users). Up to 8 if it is not heavy clicking. A good typical 802.11g would provide 18-24Mb/sec. I.e. 9 to 12 good concurrent connections (users). Up to 20 if it not heavy Clicking. The above assume good connection with all users within good range from the Wireless Source. Q - My Wireless Suddenly does not work any more. What shell I do? A - Many people seem to experience sudden interruption of their LAN Wireless connection. While it might be an indication of “trouble”, few variables can be checked first before declaring a “State of Emergency”. 1. Switch your computers Off. Switch your Wireless Router Off, Switch your Broadband Modem Off. Wait 2 minutes, Switch the Broadband Modem On, when the Modem Lights stabilized (about 1 min.) Switch the Wireless Router On, and Switch the computer On. 3. Check the Wireless Card Drivers and make sure that the Power saving is Off. 4. Try to change the Wireless transmission channel ((It is a setting in the Wireless Router/Access point). 5. Make sure that there is No sudden activity of 2.4GHz Cordless phone. 6. 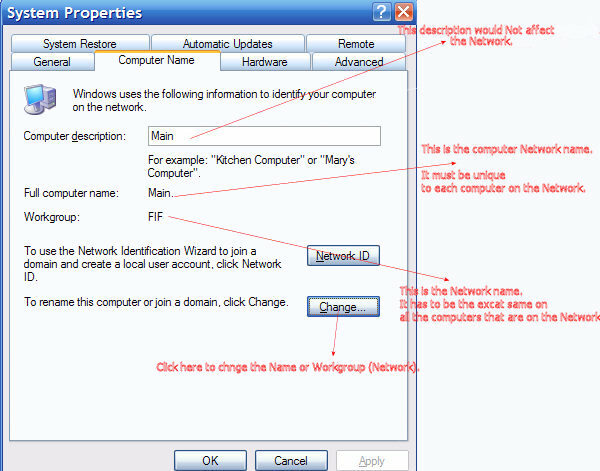 If you are using Software Firewall (it does not pertain to the Router’s Firewall) try to temporary disable it. If the Wireless comes, back check the Firewall setting to make sure that there is No blockage of local traffic. If none of the above helped place the Wireless Computer next to the Wireless Router/Access Point, disable the Wireless security and reconfigure the Wireless Connection from scratch. The next Standard of WIFI Wireless 802.11n is in the Final Process of to Hopefully be published toward the end of 2007. During 2005-6, few manufacturers made offers of Wireless Hardware released under the label of pre-N, or Draft-N, or MINO like. This hardware is Not going to be upgradeable to the final 802.11n standard. Many people ask about the performance of the preN as compare to 802.11g. Wireless range is highly dependable on the specific environment so take the following number with a “Ton of Salt” (as oppose to a grain of salt). Typical 802.11g at 10’ = 22Mb/sec. Pre-N = 30.3 Mb/sec. Typical 802.11g at 60’ = 15Mb/sec. Pre-N = 25.7 Mb/sec. Typical 802.11g at 120’ = 5Mb/sec. Pre-N = 19.8 Mb/sec. Typical 802.11g at 160’ = 1Mb/sec. Pre-N = 8.9 Mb/sec. Since the MIMO devices, were rushed out to cash on consumer impatience there is only Basic Routers, and Client Cards. Take into consideration that the whole gamut of other Wireless Devices that are needed for flexible configurations are not currently available in MIMO, and the future devices would not be compatible with the current one. A set of preN, Wireless Router and one Card can cost $180 - $250. preN Routers are just mediocre 802.11g units unless you buy the expensive matching preN card. If you have a laptop or other computers with pre-installed 802.11g cards, there is No benefit from a preN Wireless Router. I rather buy a good 802.11g for less than $40, and "Ditch" it later, instead of spending $100 for the Router, and close to $100 for every additional card, that would be obsolete in short period of time when the 802.11n standard comes out. * Your Mileage might vary under certain situations, the extra distance provided by some of the preN can provide immediate solution to an acute problem. Q - WEP pass phrase (password) does not work. A - Wireless hardware from different manufacturers might produce a different Hex string when using the same ASCII pass phrase. Generate a Hex String from a pass phrase in the Router, and then copy the actual string to the Wireless card WEP entry. The Router is configured to start with the first key. 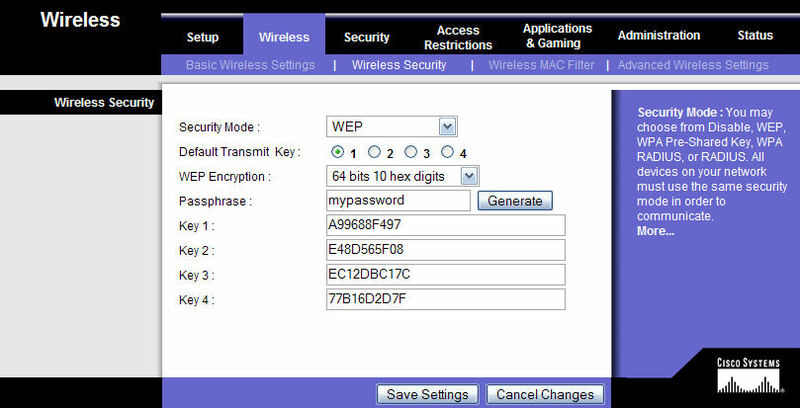 Copy the 10 digits that are in Key1, and paste it into your Wireless Card WEP entry. Q - My Computer/Network is generating a lot of action even when I am not doing any thing. I checked for Viruses Trojan’s etc. and it seems that the system is clean. What shell I do? A - This type of activity might be produced in few ways. You have to find the source ant try to terminate it. 1. Internal activities related to the computer management system that are done while “Resting”, like Indexing, updates, backups etc., or some rouge Process or and program that are busiest at rest time. 3. If the excessive activities are Internet related you can use a software Firewall log to find out where it is coming/going from/to. Q - How can I get a link to switch between the cool Vista 3D Open Windows choice. A - Click on the Vista Start button and type into the Start Search box the following line. A Window would open with an icon to Windows Switcher. Drag/send a Short Cut of this icon to a location of you choice. You can find much more pages on the issue of security in this website main page. More FAQ would be added on a weekly bases. Copyright © 2001-2010 EZLAN.NET. All Rights Reserved.